Extreme Sport Beans, from the makers of Jelly Belly beans, have 50mg of caffeine to give you that extra boost during your workout. When your workout needs a little more kick, there's Jelly Belly Extreme Sport Beans. Each serving contains 50mg of caffeine, about the same amount in a half a cup of brewed coffee. 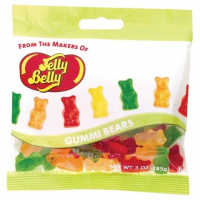 Jelly Belly Camp & Hike Gummi Bears 3 Oz 607598. 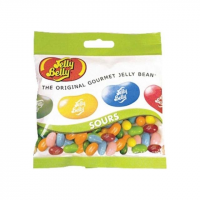 Jelly Belly Camp & Hike Sours 3.5 Oz 607574. If you take your snacking seriously, pack these Jelly Belly Organic Jelly Beans in your bag for a tasty trailside treat or as an afternoon pick-me-up. Sport Beans(TM), from the makers of Jelly Belly(R) beans, are specially formulated to fuel your body before, during and after exercise.